When I think of comfortable bedding, I think of some of the nice hotels we’ve visited. We love to travel and always feel quite spoiled when we decide to stay at a hotel that seems to deliver that glorious experience of multiple pillows, soft sheets, a supportive but not too firm mattress and the hotel bedding “look.” If you want to give your master bedroom, or any bedroom for that matter, a made over look, a great place to start is the bedding. 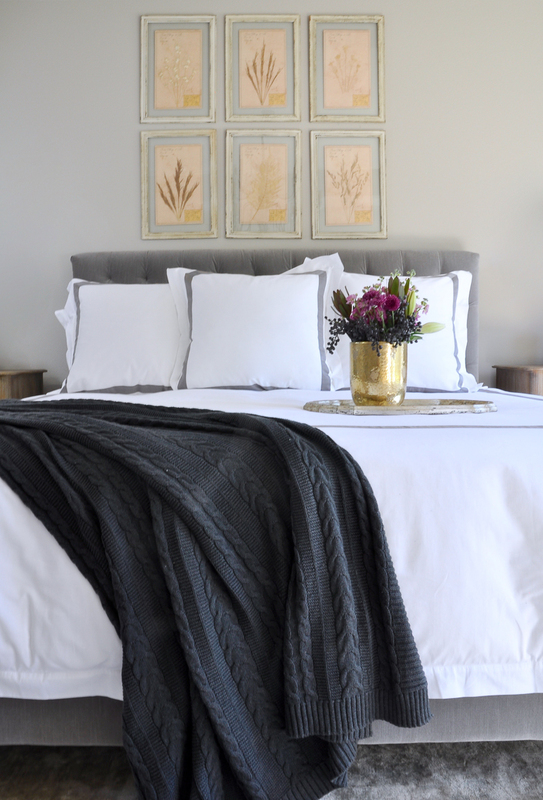 Today I’ve partnered with Boll & Branch to share my tips with you. I like to stick to an all-white look or all white with a border. This color scheme is the most relaxing by far and will lend itself to a serenity which most of us seek. Additionally, that comfortable yet elegant hotel look requires pillows. 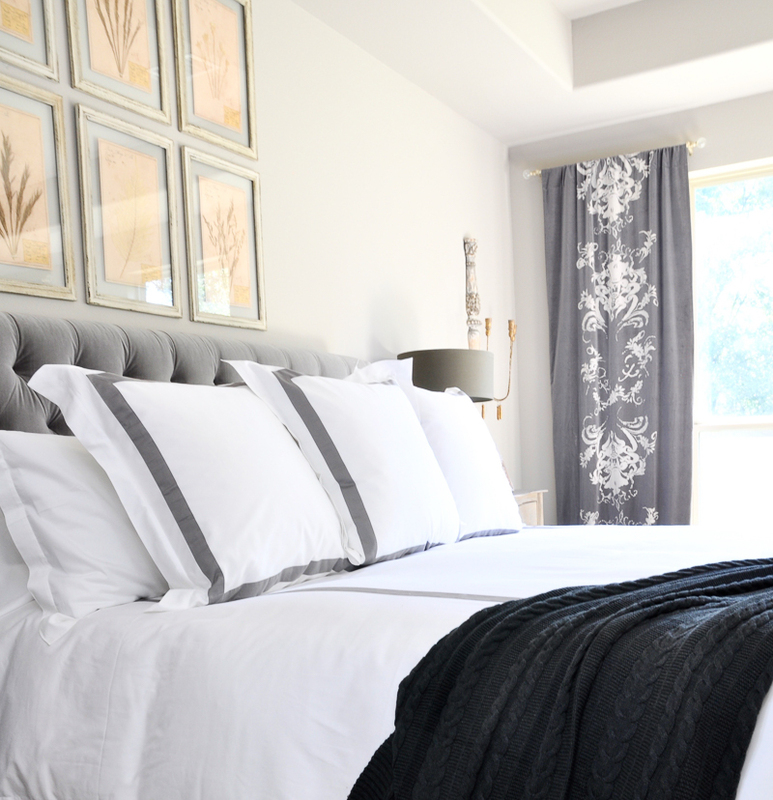 Shams, euro shams, down pillows as well as fiber-fill pillows will likely be included in a hotel room . They always seem to offer various thicknesses which is paramount when deciding to update your choices at home. 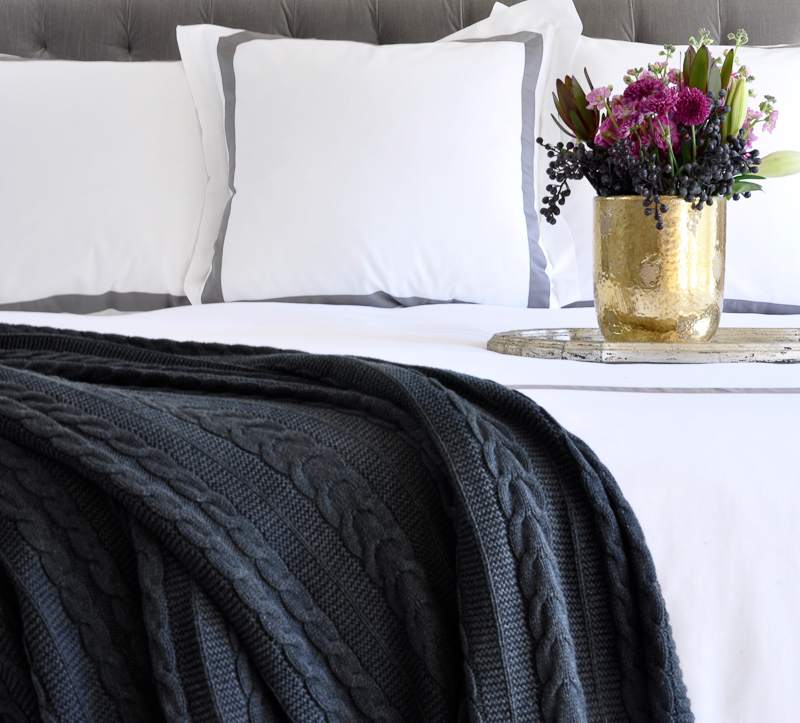 A throw adds to the look of comfort and layered luxury. Here you can see my three euro shams. I have placed king shams behind them. 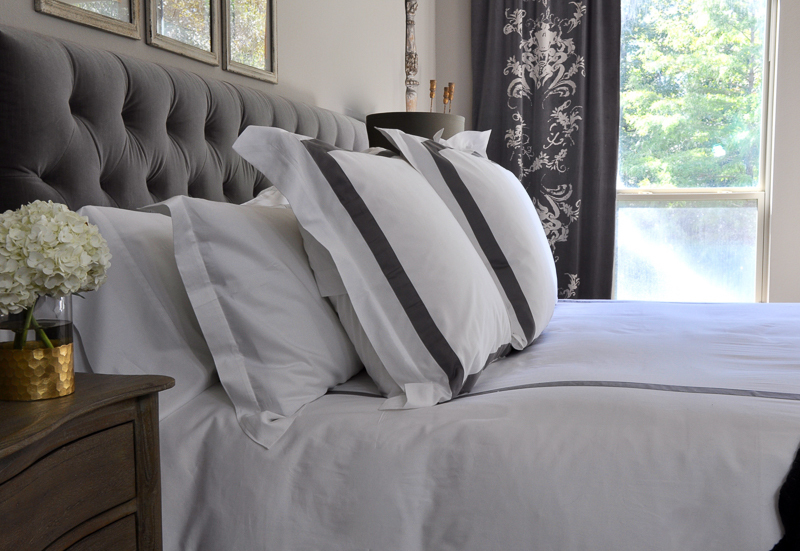 For another look, or a nice version of “at home turn down service”, set the euro shams aside and turn down the duvet cover. 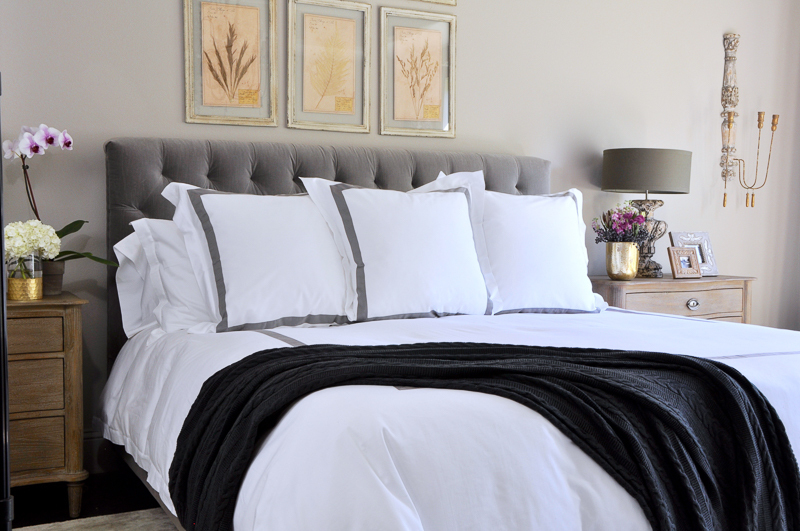 With sheets and pillowcases and as beautiful and high quality as these, this look can be as lovely as a fully made bed. Kitchen and living room makeovers seem to receive most attention. I’m not sure why that is. Perhaps it is because guests will see these rooms more than the master bedroom. 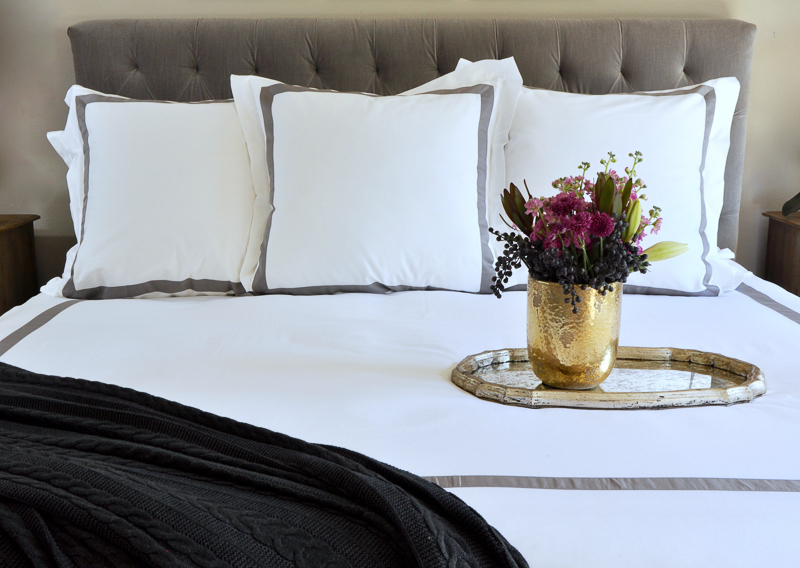 I would like to encourage you to take the time to treat your master bedroom to a luxurious makeover. 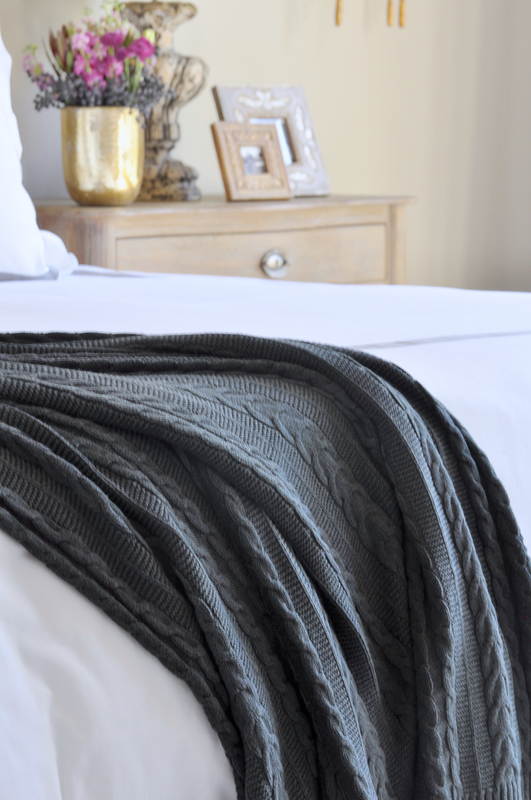 You will be appreciate this gift each morning as you wake up in a blissfully relaxing space, fit for the finest hotels. As I mentioned above, my new bedding is by Boll & Branch. Founded in New Jersey in 2014, they are a direct to consumer operation which has historically been a proven way to offer you more for less. They decided to take a transparent approach regarding the sourcing of their fine organic cottons. They know where it comes from, down to the farm and name of the family that produced it. I find that to be quite a nice attribute. They offer sheets, shams, blankets, towels, throws, etc. and the quality is quite amazing. By the way, their packaging is also unparalleled. Look for more on that soon! You can find a full source list below. You can also find a full bedroom source list here. *As mentioned above, I partnered with Boll & Branch to bring you this post, but the opinions are my own. *Some affiliate links were included in this post. Thanks so much Kel! I just know this look would be designed beautifully by you!!! 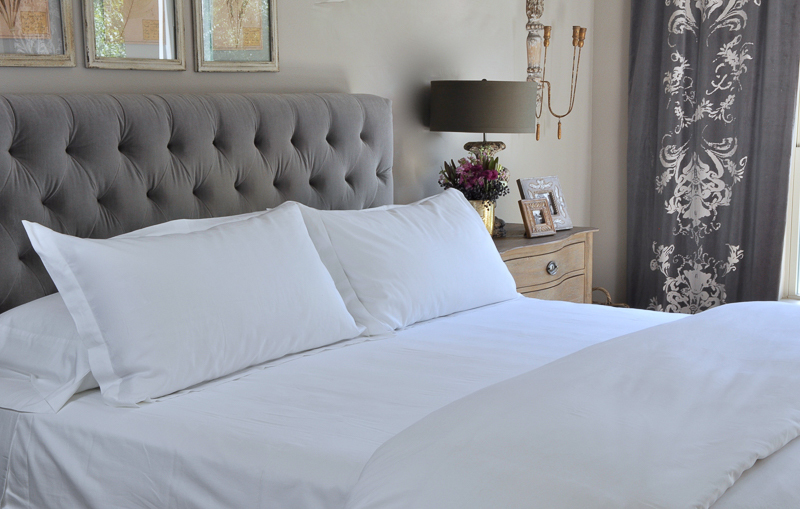 I bet the hotel bedding looked amazing to you home! Everything you do is elegant and timeless, so your comment means a lot! Very informative post I love it from starts to end definitely bookmark this lovely blog please keep updating it in future also.